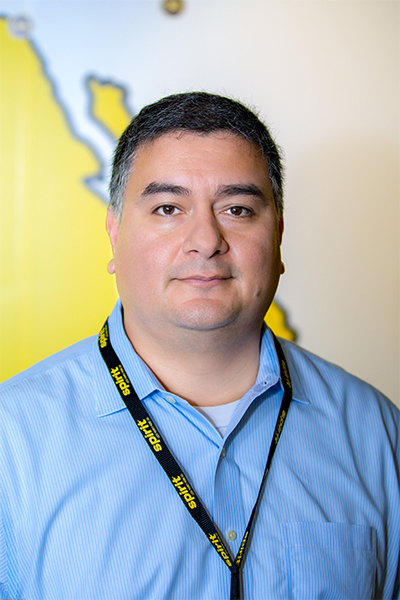 Although some aspects of the airline industry have stayed the same since Alex Rodriguez, senior director of software engineering at Spirit Airlines, began his career in the mid-1990s, many others have gone through dramatic transformations. That is especially true for the pace of technological change and how it affects his responsibilities. But with that pace comes an adrenaline rush, and that’s just one of the reasons Rodriguez loves his job. His first such success was in 2006 when he helped develop the customer-loyalty program for AirTran Airways, which was one of the first airlines to leverage real-time information to directly benefit consumers. Previously, the company experienced a lag between the time a passenger made a reservation and when the booking data was available. His years of experience have given Rodriguez foundational knowledge of nearly all airline operations. His successes are largely based on understanding how each system functions and how it is integrated, which gives him insight into how to effectively leverage connections between systems. For example, by pulling data from the operations system, he is able to inform customer inquiries into flight statuses. The ability to optimize experiences and knowledge is very much in keeping with The Spirit Way—the company’s dedication to challenging the status quo by offering unbundled, stripped-down air fares that allow guests to pay only for the options they choose. Internally, however, the focus on cost led to an early challenge for Rodriguez. Spirit’s website had been built using freeware, which was cost-effective and easy to use. But over time, it became more expensive to support and maintain. Additionally, the shareware session-management system caused continuous crashes, which resulted in the site being ranked near the bottom when compared to other airlines. So, Rodriguez introduced an enterprise system and worked with his team to redesign the site in an adrenaline-pumping four months. This dramatically increased uptime performance, improved load time, and created a more contemporary user interface. Now by using daily benchmarks and comparing the website against similar sites, Spirit has been ranked as high as number three and regularly lands at number five or six. There was some early resistance to making the necessary investment for the ultimate transformation of the site, but after a series of early quick-wins, support for Rodriguez’s efforts quickly increased throughout the company. “Once you go from crashing almost daily to stable operation and positive guest feedback, more and more people get on board and are much more willing to welcome the next improvement,” he says. The redesigned site is also mobile responsive, meaning that it adapts to mobile devices rather than displaying the full functionality and layout intended for larger screens. Under Rodriguez, the IT team also launched Spirit’s mobile app in 2017. The app provides guests with capabilities to check in, check flight statuses, add bags to booking, and select seat assignments. In the near future, Free Spirit members will also be able to make new reservations and manage their travel on the app. The app was developed in just five months in partnership with Navitaire, Spirit’s reservation system provider. Those kinds of improvements and innovations—and the speed with which they’ve been accomplished—are possible because Rodriguez has the right structure and teams in place and Spirit has a culture in which everyone works together toward common goals. Rodriguez first learned the importance of strategic alignment, with appropriate staff positioned at all levels in multiple departments, when he developed and launched Silver Airways’ reservation system in just ten months in 2012. He developed collaborative workflows between revenue, management, marketing, testing, IT, and operations so that all pillars supported the project’s structure and objectives. Over the past year, that spirit has contributed to improved overall operating performance, including more on-time departures and arrivals and fewer delays and cancellations. Moving forward, Rodriguez says that managing ongoing platform and technology changes and adapting to an evolving scope of responsibilities are his most difficult challenges. And with so many constant new sources of adrenaline, Rodriguez and Spirit’s IT department are almost certainly destined to succeed.